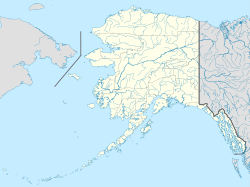 Tenakee Springs (Tlingit: Tlaaguwu Aan) is a city on Chichagof Island in Hoonah-Angoon Census Area, Alaska, United States. At the 2010 census the population was 131, up from 104 at the 2000 census. Tenakee Springs is located on the northern part of Chichagof Island at 57°46′41″N 135°13′11″W﻿ / ﻿57.77806°N 135.21972°W﻿ / 57.77806; -135.21972 (57.778095, -135.219618), on the north side of Tenakee Inlet, about 10 miles (16 km) west of its mouth in Chatham Strait. According to the United States Census Bureau, the city has a total area of 19.1 square miles (49.5 km2), of which 14.2 square miles (36.7 km2) are land and 4.9 square miles (12.8 km2), or 25.78%, are water. Tenakee Springs first appeared on the 1910 U.S. Census as the unincorporated village of "Tenakee." It reported under that name until 1940. From 1950-onwards, it reported under its present name of Tenakee Springs. It formally incorporated in 1971. As of the census of 2000, there were 104 people, 59 households, and 28 families residing in the city. The population density was 7.5 people per square mile (2.9/km²). There were 144 housing units at an average density of 10.4 per square mile (4.0/km²). The racial makeup of the city was 87.50% White, 2.88% Native American, 0.96% Asian, 0.96% Pacific Islander, 1.92% from other races, and 5.77% from two or more races. 2.88% of the population were Hispanic or Latino of any race. There were 59 households out of which 16.9% had children under the age of 18 living with them, 39.0% were married couples living together, 5.1% had a female householder with no husband present, and 52.5% were non-families. 47.5% of all households were made up of individuals and 13.6% had someone living alone who was 65 years of age or older. The average household size was 1.76 and the average family size was 2.46. In the city, the age distribution of the population shows 13.5% under the age of 18, 5.8% from 18 to 24, 23.1% from 25 to 44, 42.3% from 45 to 64, and 15.4% who were 65 years of age or older. The median age was 47 years. For every 100 females, there were 121.3 males. For every 100 females age 18 and over, there were 109.3 males. The median income for a household in the city was $33,125, and the median income for a family was $41,250. Males had a median income of $38,125 versus $26,250 for females. The per capita income for the city was $20,482. There were 9.1% of families and 11.8% of the population living below the poverty line, including 10.0% of under eighteens and 33.3% of those over 64. Tenakee Springs is served by the Tenakee Seaplane Base and Alaska Marine Highway. The Chatham School District operates the Tenakee Springs School, a school building used to support homeschooling families. In periods prior to 2016 it was a full-service school. ^ "Directory of Borough and City Officials 1974". Alaska Local Government. Juneau: Alaska Department of Community and Regional Affairs. XIII (2): 80. January 1974. ^ a b c "Geographic Identifiers: 2010 Demographic Profile Data (G001): Tenakee Springs city, Alaska". American Factfinder. U.S. Census Bureau. Retrieved April 18, 2017. ^ Chandler, Quinton (2016-11-29). "What's school like in Tenakee Springs without a school?". Alaska Public Radio. Retrieved 2017-02-13. This page was last edited on 24 June 2018, at 04:57 (UTC).